It's a common misconception that homeopathy is just for people. Physiologically, our pets are very similar to us and most drugs we rely on are used in veterinary medicine as well. This extrapolates to veterinary homeopathy, where homeopathic remedies are interchangeable for all. So if the homeopathic remedy and condition fits, then your pets should benefit as much as you would. If you don't see the combination listed below for the problem you are treating, you might find one in the "people" combination section. Also, check out the Bach Flower category on the site. You will find indications for animals as well as people. Agressive behavior, fear, destructive behavior - the Bach Flowers can help. 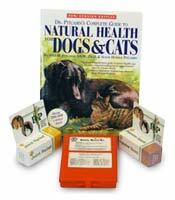 Homeopet® Homeopathic Pet Care Products HomeoPet® is a revolution for animal health. Using clinically proven, homeopathic pharmaceutical medicines to treat chronic and acute illness. Each remedy comes in a 15 ml liquid dropper bottle. 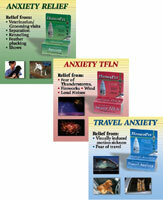 Each of the Homeopet® remedies are the same size and administered in the same manner. HomeoPet® formulas are fast acting, non-sedating and non-habit forming. Homeopet® Equiopathics line is a revolution in animal health that began in 1994 and was established to meet the increasing demand for treatment of common conditions in barnyard animals. Equiopathics are available in 120ml liquid bottles and are used for horses, donkeys, cattle and goats, pigs and sheep.